Are you looking for an impressive way to improve the value of your home? With ceramic tile from our store in Hammonton, NJ, we help you enhance the appeal of your rooms. Simple to maintain and perfect for any room, ceramic tile flooring is an excellent flooring choice for people that want a practical yet stylish option. Mazza's Carpet Hammonton has a large selection of products at our showroom. For personalized assistance, ask our flooring specialists to help you locate the perfect product for your home or business. If you want a different look than hardwood yet something harder than carpet, then ceramic floor tile is an excellent choice. This flooring product adds beauty to any room. Most importantly, because it is available in so many varieties, you’re certain to locate a color and style that satisfies your design preferences. In addition, ceramic tile lasts more than a lifetime. Don’t limit yourself if you want a new floor. If vinyl is not your style and hardwood is out of your price range, try a ceramic tile floor! With so many colors, patterns, and styles at our showroom, your options are practically endless. In addition, because we are part of the national Flooring America conglomerate, we can locate any product you want. If we do not carry it at our store, we’ll locate it for you. Why go to an average flooring store? They may have some flooring selections, but not the ones you want. In addition, they may not provide the customer attention you deserve. At our flooring warehouse showroom, we cater to all of your flooring needs. We not only have every variety of ceramic flooring, but we also provide comprehensive ceramic tile installation. 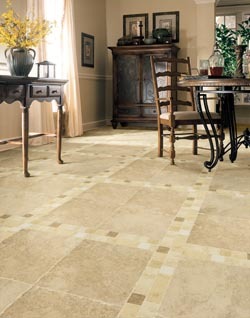 After selecting your ceramic tile floors, our expert installers will lay your new floor for you. In addition, if you are not happy with your four-star or five-star floor within the first 30 days of installation, we’ll replace it. If you ever have any problem with the installation in the future, we'll make it right at our expense. Contact us for assistance in selecting the right ceramic tile floor for your home or business. We proudly serve customers in Hammonton, Cape May, Vineland, Ocean City, and Atlantic City, New Jersey, and the surrounding areas.